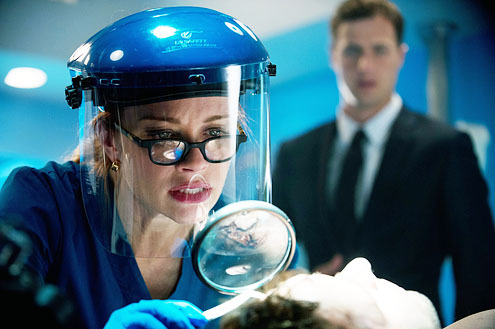 Lauren Holly (Picket Fences and NCIS) is starring as medical examiner Dr. Betty Rogers in the new ABC drama Motive — a cop drama with a twist. Creator Daniel Cerone (Dexter and The Mentalist) wanted to focus less on who the killer is and more of why the crime was committed. It also stars Kristin Lehman (The Killing and Judging Amy) as Detective Angie Flynn and Louis Ferreira (SGU Stargate Universe and Rookie Blue) as Detective Oscar Vega. In a recent one-on-one interview with Lauren, she talked about what sets the show apart from other procedurals. "It takes the typical genre and twists it ever so slightly, but that twist changes it completely. You know who the victim and the killer is right off the bat. And you go along with the detectives to figure it out. And what's really fun about it and it's in the first episode and it continues, is that you're kind of surprised first of all who is the killer and who is the victim. I always am at the beginning of every episode. And then a lot of times you have no idea how the two crossed paths and when you think you have it figured out and there's usually yet another little twist towards the end. It's really fun. It's kind of got an old school feel like a Colombo." It was this twist that intrigued Lauren right form the beginning although she did have her doubts about doing the show. "It was 100% Canadian show and I had never done anything like that before and wasn't sure if it would be the right thing to do. And then once I started working I loved everybody who I was working with both in front of the camera and behind. And when I saw the first one I thought, 'Wow, this show is really good.' I wasn't surprised at all that it was picked up." She was approached by show runner James Thorpe before they had cast anyone else. But once they found Kristin Lehman and Louis Ferreira, Lauren got the call to play Dr. Betty Rogers, a medical examiner with a quirky sense of humor. She described her character, "She is the medical examiner and she is very good at her job, has great respect for Flynn, who's played by Kristen Lehman, and they have a mutual respect, very cool relationship that you see throughout the season. They're friends." She continued, "But not only is she good at her job, she also is very good at her nightlife. She's the spicy, sassy one of the bunch and it seems that she likes younger men — especially ones that wear uniforms like fireman or policeman or things like that. Dr. Betty has quite an active nightlife. And she's super fun to play because she always enters each one of her scenes with a little bit of an impact." Lauren said being on the set of Motive is a joy and reminds her of the atmosphere on the set of Picket Fences. "It was just a gel from the get go. Everyone just fit together." She also added that the guest stars are in integral part of the show. "We have had amazing guest star performances every week. People wanted to do the show because the guest stars get such an arc. They're pretty amazing and they make the show." She recalled, "In the first episode we had Joey McIntyre. It was funny to have him to be an actor there, I kept wanting him to sing something for me, but I didn't dare ask. But it was okay because everybody who's on my show ends up naked on my table. So I like that." To Lauren there's only one downside to Motive, which is filmed in Vancouver, British Columbia. "My only complaint is that towards the end of the season it got pretty darn rainy. We have spectacular looking locations, which the audience will see, but it could be pretty wet. But that's okay because Dr. Betty likes her fedora and she has quite spectacular rain boots." As for Holly herself, she has a few passions besides acting. "I have three boys. I'm pretty passionate about them. I'm definitely a boy’s mamma. We're a thick foursome. I'm passionate about my friends. I have a core group of girlfriends that mean the world to me and I'm passionate about my morning coffee." Watch Lauren on the premiere of Motive in a special time slot tonight at 10 p.m. EST/9 p.m. Central on ABC. It will move to its regular slot on Thursdays at 9 p.m. EST/8 p.m. Central beginning Thursday, May 23.